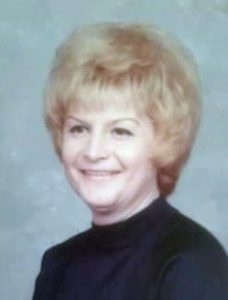 Verna Mae Spradlin, 80, died Sunday, August 6, 2017, in Clarkson, Nebraska. Memorial Service Thursday, August 10, 2017 11:00 A.M.
Verna Mae was born December 26, 1936, in Omaha to LaVern and Luella (Stevens) Osborn. She attended Omaha schools and graduated from South High. Over the years, Verna Mae worked as an accountant for the Paxton Hotel, Sears, First National Bank of Bellevue and Wal Mart. She loved bowling, all sports, Mickey Mouse Bingo, and travelling. She was lots of fun and very generous. Verna Mae enjoyed watching TV Ministries and listening to Christian Music. She was a member of the Gospel Satellite Pentecostal Church and is remembered by her family as the "Queen" of QVC. She is survived by two daughters; Lori Ann Ferguson and Lynette (William Jr.) Foran, all of Schuyler, grandchildren Jamie and Dave Brown, Katie Foster, Ryan Ferguson and Bob and Sarah Foran, great-grandchildren Devon Adams, Preston Robinson, Abby Ferguson and Kyle Roddenberry. Also surviving are her siblings; Donna Houfek, Ron and Myrna Osborn, Duke and Janet Osborn and Kathy Salcedo, numerous nieces and nephews. She was preceded in death by her parents, son-in-law George Ferguson and brother-in-law Jimmy Houfek.